In 1909 National Geographic Society published "Scenes From Every Land" by Gilbert Hovey Grosvenor (available for viewing online through Google books. It is a collection of 250 photographs from around the world and contains a few very interesting photographs of Greeks that I thought you might enjoy. 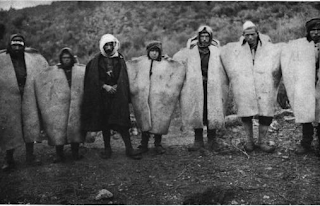 "Greek Shepherds, near Colophon, Asia Minor, in their Sheepskin Coats". "Jayce, Bosnia, A Greek Orthodox Beauty"
Good luck with your continued research into your Greek family history. 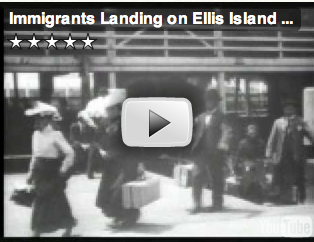 I recently found three videos on YouTube that show Immigrants at Ellis Island. I have seen snippets of these films before, but the other day I sat down and really watched them. These videos are not about immigrants from Greece, but our ancestors might as well be, and very well could be, in the photos. I looked carefully and imagined my grandparent's trip to the United States. Most of these people are arriving with either one small suitcase or a bag, that looks like a pillow case, filled with their belongings. As I read another bloggers comments recently, sorry can't remember who said this, but we go on vacation with more luggage than these people had when they stepped off the boat. Every nationality mixed together. Imagine - I am sure my grandparent's had never been exposed to people from other countries before this journey, what a shock it must have been to see, for the first time, people dressed so differently, and speaking all those different languages.